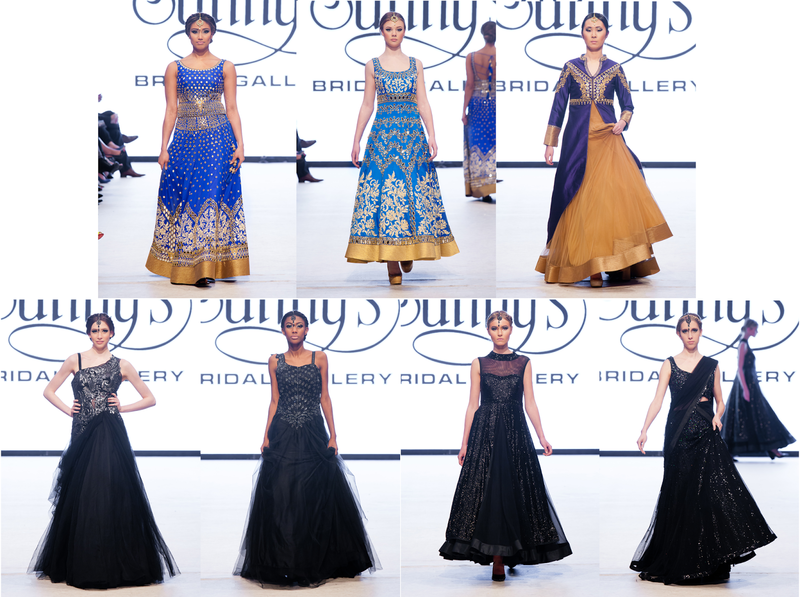 Opened in 1995, Sunny's Bridal Gallery was the first high end South Asian Bridal Boutique in Vancouver. Hundreds of couples from all over North America have crossed their threshold in the last two decades looking to find just the right wedding attire to make their day special. They were not disappointed. Custom work is available to meet each client's personal needs and Indian designer labels are a staple. Available are women's Lenghas, Sarees and Suits as well as men’s Achkans, Jodhpuris and Kurta Pajamas. To compliment the look, the gallery offers an impressive array of accessories. 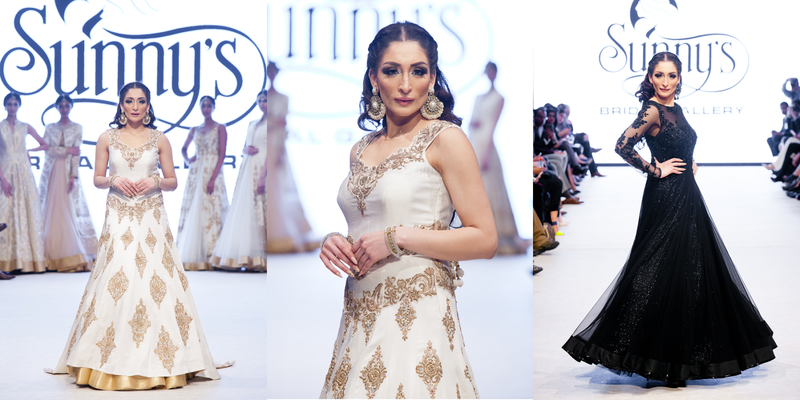 When the lovely Mesha Toor emailed me to let me know she was a part of Sunny's Bridal fashion show at Vancouver Fashion Week (VFW), I was instantly excited. Toor is an actor, model, coach and more, with an impressive resume. Anything she commits to she gives 110%. It was such an honour when she attended my book launch in January 2015, and it was now an honour to have the opportunity to support her in return. Toor was not only the fashion show coordinator/stylist - she was the opening and final model. It had been far too long since Vancouverites had the privilege of seeing her on the runway and I was delighted she was back where she belonged. Teenage upstarts beware - a model with extensive industry experience brings a confident, magnetic presence that cannot be easily matched. Toor - you rocked it. Before the show, all invited guests were welcomed by owners Sunny Sethi and Reshu Sethi to a lovely private reception featuring complimentary hors d'oeuvres and desserts courtesy of Chef Arjun Sethi and his team at My Shanti. Featured celebrity guests in attendance included Shushma Ji, Mo Dhaliwal, Bal Brach, Nira Arora and Vikram Vij. Unfortunately, as I am in my seat for all runway shows, I was unable to pop by. Hopefully I can meet the owners in their bridal gallery soon. 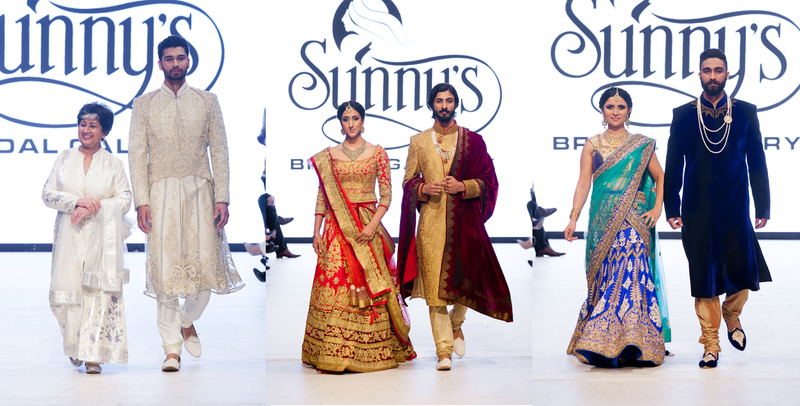 Then it was time for Sunny's Bridal to take their turn on the runway. From opening note to final bow, they wowed us all. I thought the flow of this show was truly beautiful. It began with five models dressed in white/gold. After a brief pause for the photographers in the pit to capture the moment, the runway show commenced with Toor leading the way. One high-end look after another took us through an eye-catching palette of colours. After White/Gold, there were looks in Pink/Gold, Orange/Gold, Blue/Gold and finally evening wear in Black that would be a perfect choice for any high-end gala. Most garments featured lightweight embroideries, making them wearable for outdoor events such as destination weddings, and also making them more appealing to the main stream communities. There was a wide selection of looks for both sexes. For women we saw very formal Indian wear but with a more contemporary flare, lightweight hand done embellishments and modern designs on very formal and rich silk fabrics. For men, the collection offered wedding wear created from hand woven fabrics with hand embellished patterns. One element during the show that truly charmed the audience, was the decision to show several couples starting with a mother/son combination. The positive reaction from the audience was audible and I saw a smile on everyone's face. This was followed by several stunning bridal looks for couples. I honestly couldn't pick a favourite - but the Gold/Burgundy mens suit in the centre image below is definitely a top contender. 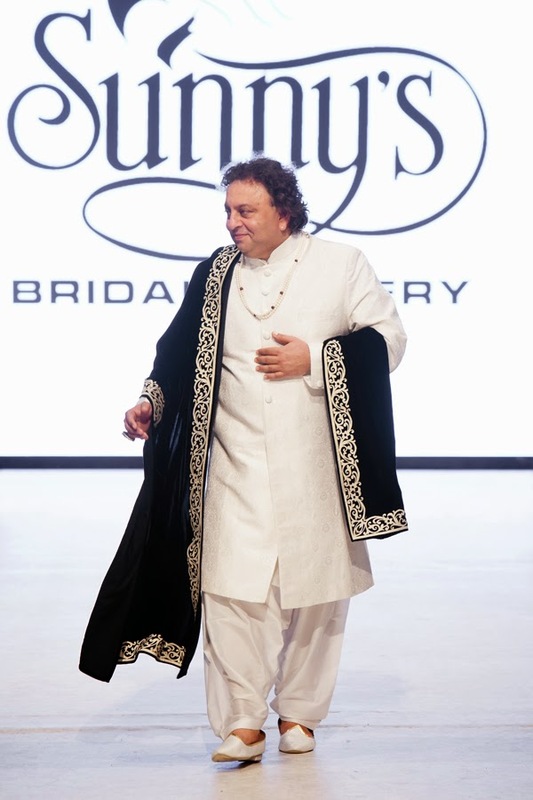 Last down the runway before the owner's final bows was Vikram Vij - Indian-born Canadian chef, cookbook author, and television personality (Dragon's Den). He is also co-owner of Vij's Restaurant, Rangoli Restaurant and My Shanti Restaurant. I had the pleasure to meet Vij once when I was taken by my friend Mita Naidu of Lotus Eye Designs to dine at Vij's Restaurant. He was utterly charming and the food amazing. I loved how he took his time to walk down the runway, turning right and left to acknowledge his many, many fans. 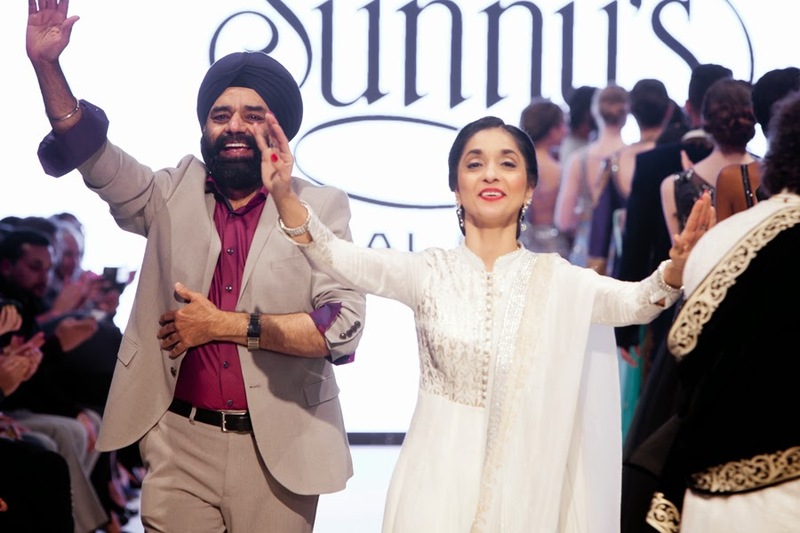 The show ended with owners Sunny Sethi and Reshu Sethi taking a celebratory bow to an appreciative audience. The warm response they received was well earned. Kudos to all involved on a fabulous show! Jessie Thiara, Esha Singh, and Sahab Singh.